Star Brand. 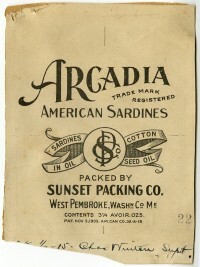 American Sardines in Cottonseed Oil. 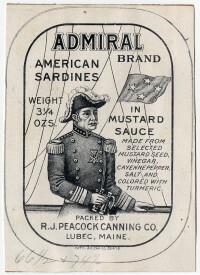 Admiral Brand. 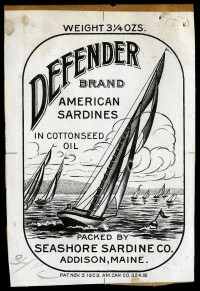 American Sardines in Cottonseed Oil. 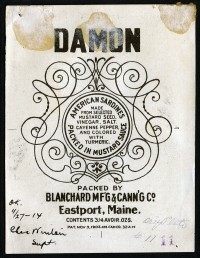 American Sardines in Cottonseed Oil. Laurens A Cie.
Apollo Brand. 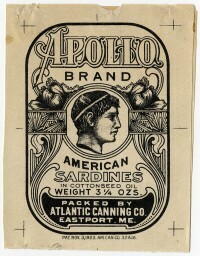 American Sardines in Cottonseed Oil. Aunt Mandy’s Brand. 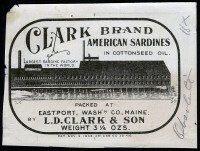 American Sardines in Cottonseed Oil. Banquet Brand. American Sardines Packed in Mustard Sauce. Bayshore Brand. 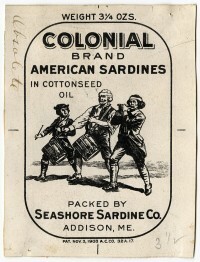 American Sardines in Cottonseed Oil. Bayshore Brand. American Sardines Packed in Mustard Sauce. Campfire Brand. 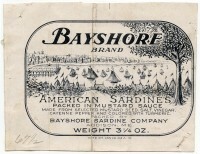 American Sardines in Cottonseed Oil. Casco Brand. 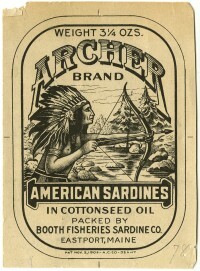 American Sardines in Cottonseed Oil. Cayon Brand. 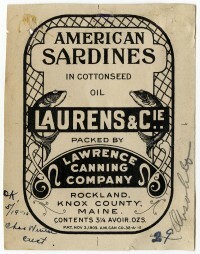 American Sardines in Cottonseed Oil. Circle Brand. 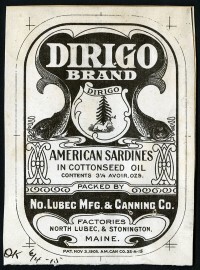 American Sardines in Cottonseed Oil. Clark Brand. 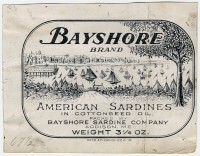 American Sardines in Cottonseed Oil. Cluster Brand. 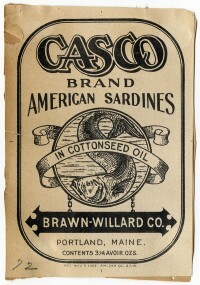 American Sardines in Cottonseed Oil. 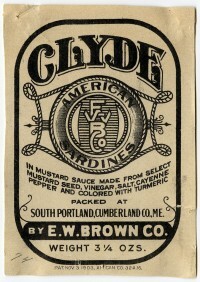 Clyde. 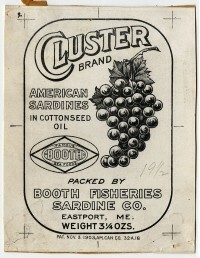 American Sardines in Cottonseed Oil. 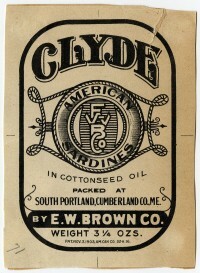 Clyde. American Sardines in Mustard Sauce. Coat of Arms Brand. 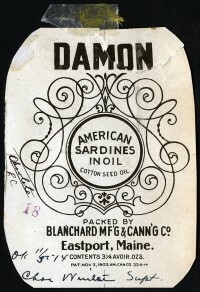 American Sardines in Cottonseed Oil. Cobscook Brand. 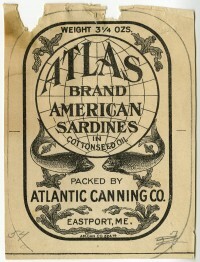 American Sardines in Cottonseed Oil. 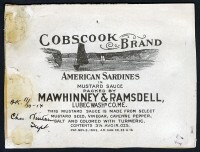 Cobscook Brand. American Sardines in Mustard Sauce. Colonial Brand. 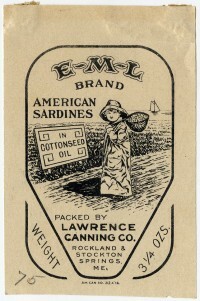 American Sardines in Cottonseed Oil. Cow Brand. 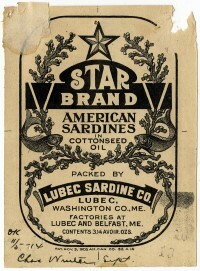 American Sardines in Cottonseed Oil. 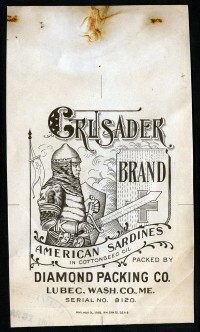 Crusader Brand. 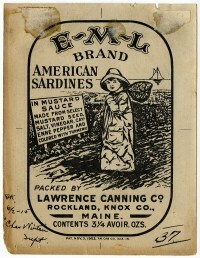 American Sardines in Cottonseed Oil. 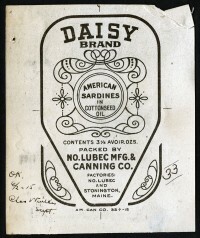 Daisy Brand. 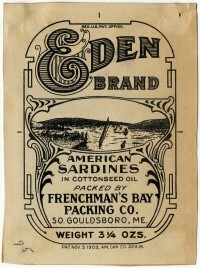 American Sardines in Cottonseed Oil. Damon. 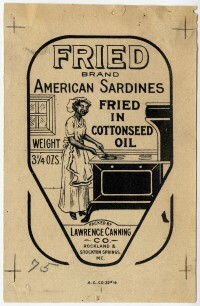 American Sardines in Oil (cottonseed). Damon. American Sardines Packed in Mustard Sauce. 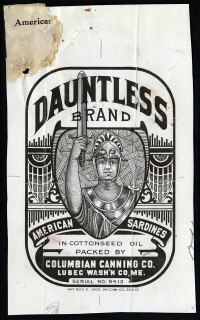 Dauntless Brand. 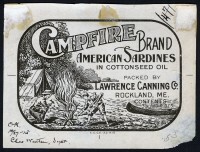 American Sardines in Cottonseed Oil. Defender Brand. 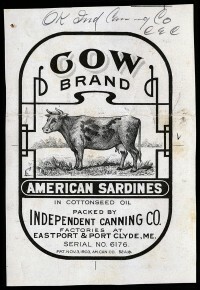 American Sardines in Cottonseed Oil. 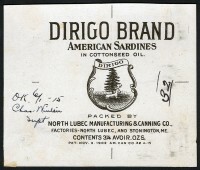 Dirigo Brand. 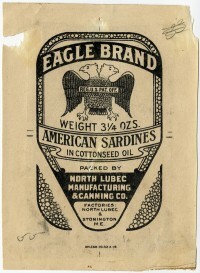 American Sardines in Cottonseed Oil. 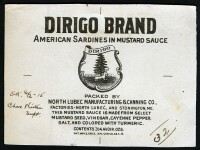 Dirigo Brand. American Sardines in Mustard Sauce. 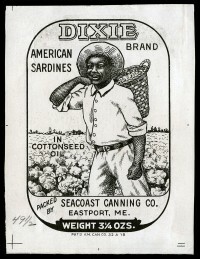 Dixie Brand. 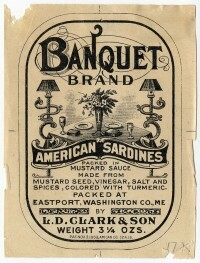 American Sardines in Cottonseed Oil. E-M-L Brand. 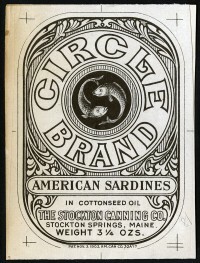 American Sardines in Cottonseed Oil. E-M-L Brand. American Sardines in Mustard Sauce. Eagle Brand. 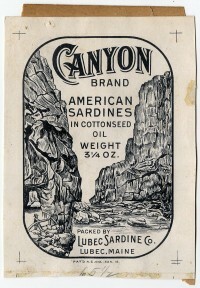 American Sardines in Cottonseed Oil. 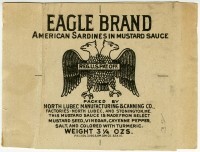 Eagle Brand. American Sardines in Mustard Sauce. 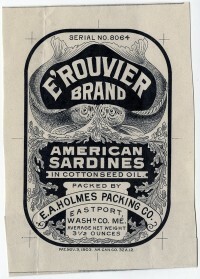 E’rouvier Brand. American Sardines in Cottonseed Oil. Eden Brand. American Sardines in Cottonseed Oil. 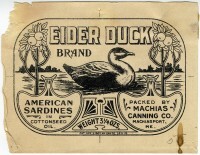 Eider Duck Brand. American Sardines in Cottonseed Oil. Exposition Brand. American Sardines in Cottonseed Oil. Fried Brand. Amercan Sardines Fried in Cottonseed Oil. 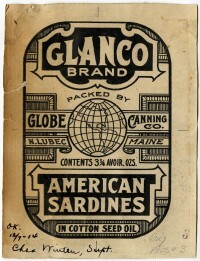 Glanco Brand. 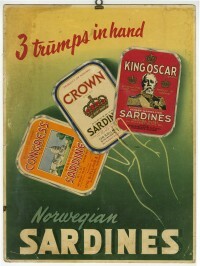 Sardines in Cotton Seed Oil. Golden Pheasant. American Sardines in Cottonseed Oil. Grouse Brand. 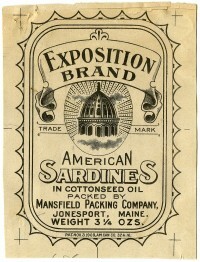 American Sardines in Cottonseed Oil.